Build an unlimited number of web sites that constantly update with FREE content... don't waste countless hours posting articles and maintaining your sites! Build 'em. Set 'em. Forget 'em! Instantly become an Adsense ads placement wizard! The templates included in our 'Build Blogs Fast' package are optimized to increase your Google Adsense CTR and boost your adsense revenues with ease! Feed the search engines their 'favorite meal' with your optimized sites! By simply using our methods, search engine spiders will index your sites more than the common blog. We provide you with everything you need to achieve higher search engine results! Easily implement multiple streams of income! You'll not only enjoy increased Adsense CTR but, you can promote affiliate products with the included plugin that turns your free content and articles into income producing contextual ads! Edit the look and feel of your sites in seconds! Just select one of our six color templates for instant changes! Not only does our video show you how to do all this, we've compiled everything (and I mean everything) you'll need! 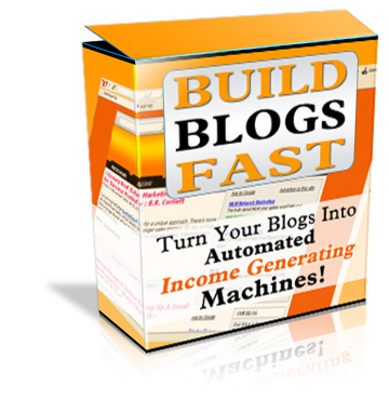 You won't need to buy anything else to set up these auto-pilot sites.